In the lead up to Christmas, activities start to wind down at The Woodhorn Group as customers prepare for the festive season, however, today was slightly different. The farm received its regular load of chicken manure, yet when the doors opened our farmer, Stuart, spotted something at the back of the lorry. After the load was dispersed onto the ground, a single chicken remained. It could have been a scene from the film Chicken Run, as we visualised the chicken planning its escape from its home, making the strenuous journey in the back of a lorry and ending up on our organic farm. Stuart gathered the chicken and being the animal lover he is, decided to rescue it and take it home. 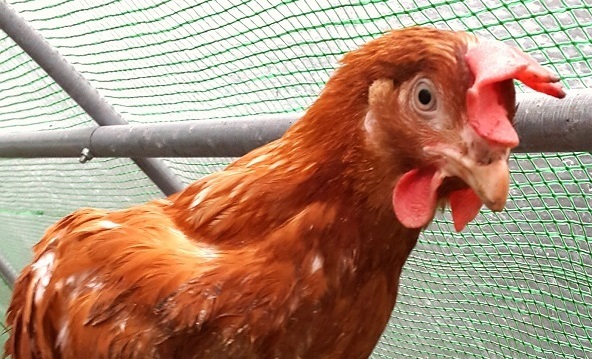 Keeping in the festive spirit we’ve decided to name the daredevil chicken, Jingles, and even though it probably isn’t a Christmas miracle, it reminds us that there can be happy endings, even for a chicken.